Driven by their desire to contribute to the quality of the built environment and wider society, architectural firms collaborate with other actors in heterogeneous interorganizational projects to provide products and services that solve complex spatial challenges. Due to ongoing developments in society and the construction industry, the professional roles that firms perform within these projects have become increasingly diverse, blurred and contested (Ahuja et al., 2017). 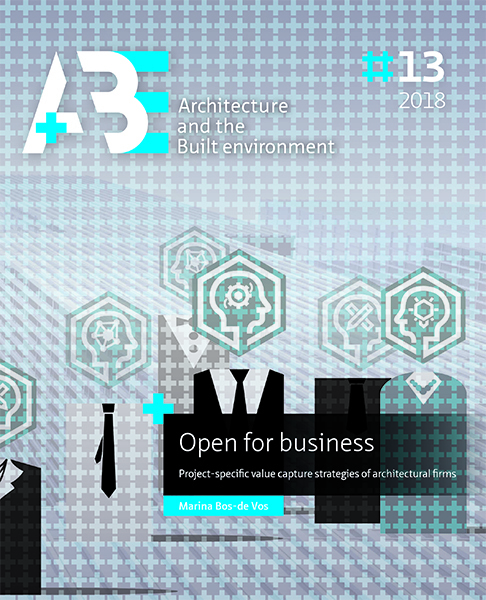 While the role of architectural firms historically was clearly defined (Burr and Jones, 2010; Jones and Lichtenstein, 2008), they now cover a broad spectrum of activities and responsibilities, ranging from ‘full-service’ providers to specialist advisors for a certain discipline or phase (Duffy and Rabeneck, 2013; Van Doorn, 2014). The diversity in, and ongoing pressure on, roles often leads to firms experiencing difficulties when co-creating or capturing value in projects. For example, firms are not always able to realize the level of quality that they pursue, or fail to make a decent living out of their service delivery. While attempting to reconcile the demands of the many stakeholders that are involved in projects, architectural firms struggle to realize their professional and commercial goals. Research in the field of management has shown that the simultaneous use of multiple business models helps firms to deal with different demands and opportunities when operating in diverse contexts (Aversa et al., 2015; Kujala et al., 2010; Sabatier et al., 2010). Constant innovation of these business models further contributes to the resilience of organizations (Chesbrough, 2010). Although business model theory has significantly contributed to the understanding of organizations and their collaboration in the value chain, existing theories have been largely developed on the basis of insights from traditional, entrepreneurial firms (Zott et al., 2011). As a result, business model theory primarily addresses how organizations generate financial revenues from the value that they co-create. Considering that organizations’ single-minded pursuit of profits is increasingly constrained by other important goals, such as social responsibility (Thompson and MacMillan, 2010), more insight is needed into how organizations might capture multiple dimensions of value through their business models. Businesses that by nature pursue multiple strategic goals, such as architectural firms or other creative and/or professional service firms, represent an interesting empirical context for such investigations. 2) to support architectural firms in dealing with the value capture challenges they face in practice. 1 How do architectural firms capture value in construction projects? 2 How can architectural firms be supported in developing strategies for value capture? I chose to focus specifically on firms’ value capture in projects to gain detailed, context-specific insights into the challenges and opportunities that firms encounter when attempting to balance multiple strategic goals. Multiple construction projects were studied to reveal overarching patterns in the value capture strategies of different architectural firms, across different project settings. The research draws on 25 interviews with architects and 15 interviews with clients from 24 recently completed construction projects, as well as observational data from 17 project-oriented strategy meetings to examine architectural firms’ value capture strategies both in retrospect and as they unfold in practice. Based on an engaged scholarship approach (Van de Ven, 2007), I used my own background and continued involvement in architectural practice to conduct my research. The empirical insights gained were further developed into a value capture toolkit that can be used by architectural firms to engage in projects and manage their value capture activities in these projects with greater awareness. The empirical research findings and toolkit were validated on a regular basis in conferences, discussion groups and co-organized workshops with different academic and professional communities. In the remainder of this introduction, I will first present and discuss the theoretical background, which combines a project-oriented perspective on business and a multidimensional perspective on value. The research’s scientific, practical and societal relevance will then be discussed. Subsequently, I will present the research context, paying specific attention to the roles of architectural firms in construction projects, which served as an empirical setting, and the overarching research project, futurA, in which the research is embedded. Following this, the methodological approach is discussed, with a particular focus on why a combination of empirical and design-oriented research is useful to increase our understanding of value capture by architectural firms and other creative and/or professional service firms. The introduction concludes with an overview of the remaining chapters and how they are related. Creative professional service firms experience difficulties in establishing healthy and sustainable business models, as they must reconcile the often competing value systems upon which the models are based. They continuously negotiate between professional values and beliefs and the firm’s commercial goals, resulting in struggles between identity and strategy. Adopting a work lens, this study investigates the reciprocal tensions between identity and strategy in 17 business model design workshops with members of architectural firms. Observational data show that practitioners collaboratively construct their business models around professional values, thereby strengthening organizational identity, but constraining innovation in their business models. The research contributes to the body of literature on business model design processes by articulating how professional aspects of identity enable and constrain practitioners in shaping and being shaped by their strategic actions and decisions. This chapter presents the design-oriented part of my research, introducing a toolkit that can be used for the capture of value in projects. Although the toolkit was specifically designed for architectural firms involved in construction projects, it can also be used by other organizations and in other project contexts. The chapter is organized into four main sections. It begins by briefly setting out the relevance of the toolkit, with insights from the literature and the previous empirical chapters used to provide a background to explain why architectural firms may benefit from a value capture toolkit. It then presents the development process, describing the methodology used, the steps that were followed to arrive at the final design of the toolkit and the key resources that served as input. Following this, the different components of the toolkit are presented. These include four generic professional role identities taken on by architectural firms, a board game with cards for value capture, an overview of specific value capture challenges and recommendations in relation to each of the four role identities, as well as nine example projects. The chapter concludes with some notes on the toolkit’s usage, including the proposed settings in which it may be useful and suggestions for successful application. This research aimed to investigate how architectural firms capture value in the projects in which they are involved, and how architectural firms might be supported in developing strategies for value capture. Section 7.1 provides a summary of the key findings of the research, first with respect to the understanding of architectural firms’ project-based value capture developed in the dissertation (§ 7.1.1) and second in relation to the toolkit for facilitating the development of project-specific value capture strategies (§ 7.1.2). Section 7.2 discusses the significance of the findings for research on organizational value capture, the management of architectural firms and business model design processes, before presenting suggestions on directions for future research. Then, Section 7.3 presents the practical implications of the research for collaborative work in creative projects, and for architectural firms and other firms that are involved in these projects. In Section 7.4, the implications for education are discussed. Finally, I will reflect on the research approach and the relevance of the results in Section 7.5.